In order to investigate the formation of the solid solution BiFexCo1-xO3, the synthesis and thermal decomposition of the inorganic complex Bi[FexCo1-x(CN)6].4H2O has been studied. The starting material and the decomposition products were characterized by IR spectroscopy, thermal analysis, laboratory powder X-ray diffraction and microscopic electron scanning. 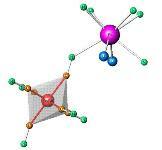 The crystal structures of these compounds were refined by Rietveld analysis. BiFexCo1-xO3 were obtained from the thermal decomposition at 600 ºC of the complexes for values of x = 0.7-1.0.